Mormon Mommy Writers and Friends: "A Wordplayer's Manifesto"
A while back Ash found a little something on Facebook and shared it with me. We both felt that it was so great we just had to share it. 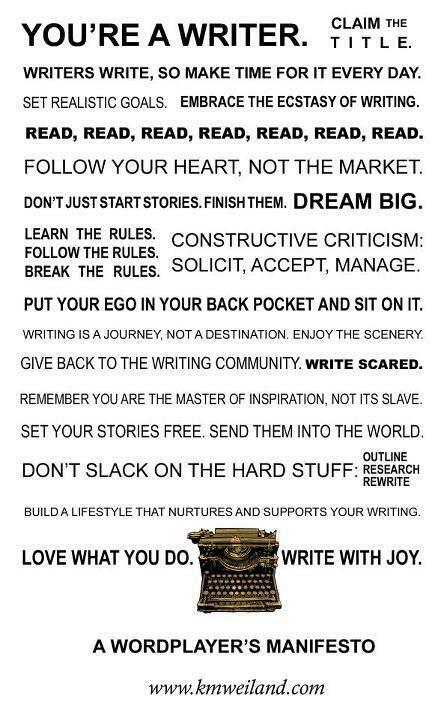 Some of the words, I'm sure, you've all heard before, but who couldn't use a little more encouragement with our writing every now and then? The image we are sharing was produced by K.M. Weiland, and I encourage you to check out her website. She has a whole section dedicated to helping writers and giving advice. To avoid any further tedious blabbing on my part, here is it. I hope you all enjoy it and are able to take something from it. Saturday So What: Why can't I be you? Have We Mentioned The Contest? Do Your Characters have Morals? D.E.W. You Need Something Good To Read? JUST WRITE SOMETHING, DANG IT!